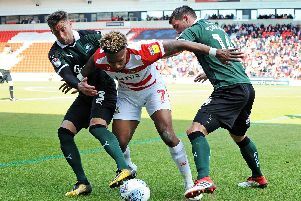 Nathan Tyson has urged his Rovers team mates to finish on a high by winning their final two games of the season. Rovers travel to Notts County tomorrow before rounding off the season with home clash against local rivals Scunthorpe United. And Tyson wants two wins from two to see the season out in style. “We just have to finish on a high and look back at what we’ve achieved,” Tyson said. “It’d be nice to get into the 60 points and look to build on that going into next year. “I said to the lads that we should be looking to go the last five games of the season unbeaten. We were on track but it didn’t happen against MK Dons the other night. The 32-year-old believes it is important for any side to set a target, whether or not they are fighting for promotion or relegation. He said: “You have to have something to play for or you’re just going through the motions. That’s when you get beat five or six nil. “It’s about taking pride in yourself and having a bit of respect for the club, players around you and the fans. “We can go out and enjoy these last two games. Notts County are going to be pushing hard because they need the win and then we’ve got a derby against Scunthorpe. Both of those are great incentives for us to chase the wins. “It is hard when you’re not really chasing anything. “It’s strange for me because it’s the first time in a while I’ve not actually been playing for anything, relegation or promotion.